A roll-up desk is a traditional working desk, and they were extremely popular in the 19th century. These desks are made up of wood and plywood, and there are so many drawers and compartment to keep everything in their right place. 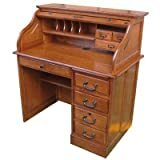 It is the handiest desk that working people can buy and keep their computer and dedicate different drawers for different items for easy retrieval and faster processing in work. The following is the list of the top 10 best roll up desks in 2019 that you can consider buying. This is a traditional looking roll-up desk with warm honey oak color. Just like the traditional roll-up desks, there are two side drawers and one large front drawer. The front part has pulled up design, and you can shut it off when not in use. The construction is very sturdy, and it is easy to clean and maintain. The desk is slightly on the higher side in terms of overall weight which is 99 pounds and therefore, somewhat inconvenient to move from one place to another. 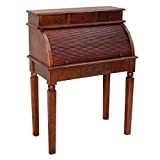 This roll top desk is made up of hardwood with a satin finish, and there are three drawers available with one at the top and two on the sides. Additionally, there are two letter slots, and one can pull down the front when not in use. The straight tapered legs provide stability, and the maximum weight capacity is 48 pounds. The size of the desk is compact 42 x 17 x 31 inches. This is one of the most gorgeous and versatile rolls up desks, and the design is rustic while the color is bright and shiny. There are 4 drawers on each side of the protruding front, and additionally, there is a large middle drawer in between. The writing space is fixed and quite large, and following that, there are more drawers of different sizes. It is a true secretary desk, and some assembling is required for the same. It is one of the heaviest desks with 132 pounds, and the dimensions are 54 x 28.5 x 49 inches. This is another product from the popular brand, and just like the previous product, the construction is on the similar line. The only difference is that the color which is slightly dark and precisely burnished walnut. The dimensions are the same, and so is that weight. The height is slightly lower, but the base is heavy such that it does not get replaced easily on minor impact. The assembling is easy, and you can keep everything in an organized way. This is a complete student roll-up desk, and there is enough space on one side to keep their feet comfortably. The front desks are on one side, and the other side is empty except for a large pull out drawer. The writing space is generous, and there are further compartments after the writing space for easy and organized storage of items. The product weighs 99 pounds, and the dimensions are 40.5 x 24 x 45 inches. The color is burnished walnut, and the surface is well polished for glossiness. This is the most crowded roll-up desk in terms of drawers available. The frame is made up of oak, and the locking file drawer in the middle is the largest. Moreover, there is a locking roll top, and the design is very traditional and timeless. It can become the centerpiece of your room, and some parts have hardwood plywood and wood Veneer for a smooth surface finish. The bottom vertical file cabinet drawers and the relatively small drawers on the top inside are enough to dedicate different drawers in different spaces. This is a compact roll-up desk with one center cabinet, and there are multiple side drawers on both sides. The color of the desk in slightly on the darker side and it will go well if you place it around the antiques you have at home. The support pillars are beautifully designed to make the desk look premium. The top part has locking pull up space, and this is a complete hard-carved solid hardwood desk. This is the ultimate office or workplace roll-up desk where you can place your monitor, CPU, keyboard, and other accessories and work in the most organized way. The top part is spacious for keeping decorative objects. There is no dearth of drawers and open compartments for easily accessing the objects. The desk is quite large with the dimensions of 54 x 29 x 51 inches and made up of hardwood and Veneer finish for smoothness and glossiness. This is a covered roll-up desk that will help to keep the dust away from the computer and other electronic parts you keep in it. There are vertical cabinets on the front side of both ends where you can keep the cabinet and other large objects. There are many open compartments on the top side for easily accessing the objects anytime without any need for opening or closing the drawers. The top part can be used as a bookshelf, and it is the heaviest desk with 302 pounds of weight. 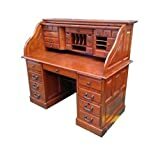 This is a rustic style deluxe roll-up desk that will fulfill all the requirements you may have as a student, secretary, or other office workers. There is a literally endless number of drawers, and the base is extremely strong to survive impact without moving much. Some of the compartments are open for keeping small items for easy access. The finish is glossy, and its assembling is rather easy. 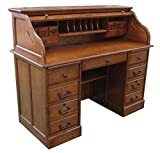 While buying a roll up desk, you should consider the fact that whether you will keep a computer on your desk on not. Not all roll up desks is tailor-made for placing computer comfortably. Moreover, you should be clear of space availability and the number of drawers you need. There are complete roll-up desks as well as semi roll up desks available. Depending on your budget and requirements you should choose accordingly.